Lowest US/Canada Price By Far! FREE SHIPPING means MenuCoverMan pays the freight. Certain minimums must be met, & Free Shipping does not apply to all geographic areas, nor all products. $8.75 added to all residential shipments. PRICES SHOWN are for the pictured product. Many other configurations are available for that product line. Click the pic to view all the variations & their prices. Pricing in the tables on this page are "As low as.." For example, three prices may be offered for purchases at different quantities. The price shown on this page is the lowest of those three prices. USA MADE symbol indicates products which are made by skilled & dedicated American workers. The majority of the products here are proudly USA made. FREE SAMPLES! Applies to most of the menu covers on this site. 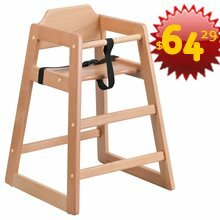 S/H for lower 48 $16.50. 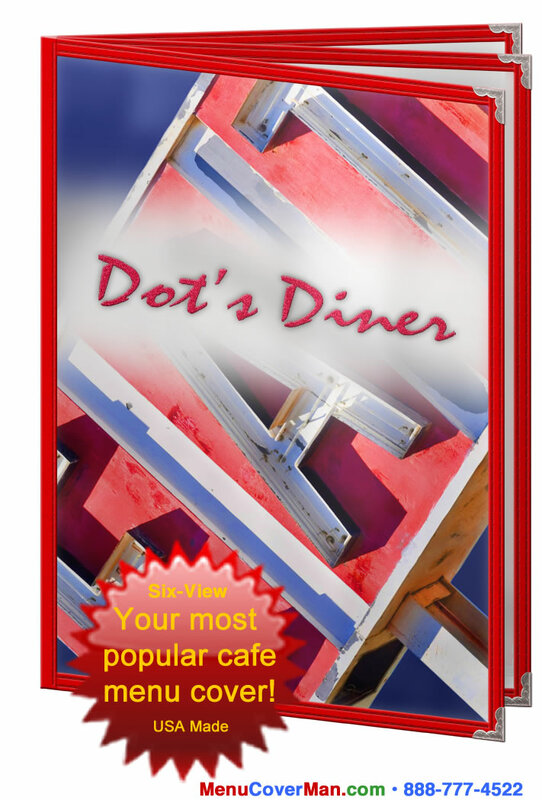 Pick a great FREE full-color cafe-cover insert imprinted with your restaurant's name! Click here to find out more.. value for you. Call now & speak directly with a friendly & knowledgeable person.. never any automated phone nonsense. ALTERNATE PHONE: Call 215-278-4030. Bistro / Most Avail Finishes! Here's the complete selection.. many sizes, different configurations- Clarity® all clear vinyl menu covers are inexpensive, & they're 100% in stock & can ship out today. This is a great choice where "truly low cost" meets "easy to clean!" 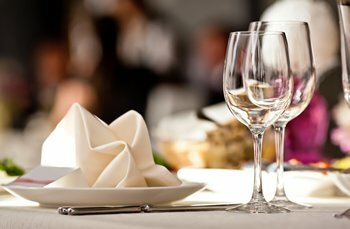 A great selection of table tents, from inexpensive to very elegant, allow you to talk to your patron throughout the meal- & increase your ticket size. Add A Pages add flexibility to change a menu fast! 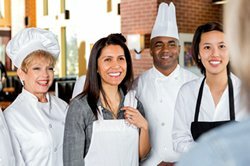 You need the ability to quickly modify your menu with the time of day, the event, the holiday, the chef.. you know the drill. These sewn cover accessories give you that flexibility in spades. Call now & speak directly with a friendly & knowledgeable person.. there is never any automated phone nonsense. With the two clear heat-sealed center-load pockets on the inside, you'll have 2 views. Minimum: 2 dozen. 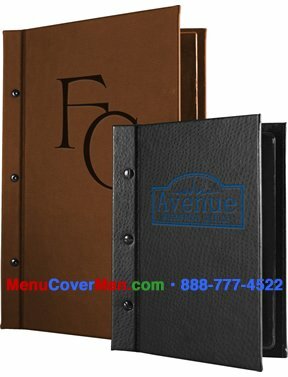 Price shown above is PER DOZEN MENU COVERS. Available in two popular sizes, black only. "Menu" imprint no additional charge.. IMPORTANT NOTE: These covers have no stiffener incorporated to give them backbone- they are simply vinyl. 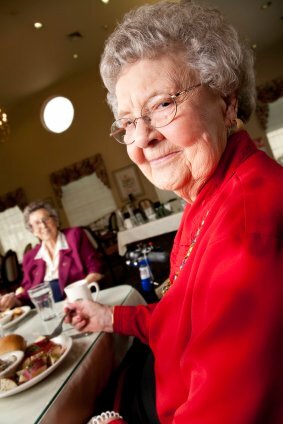 Great for institutional settings & nursing homes. $16.50 flat rate shipping in the lower 48. 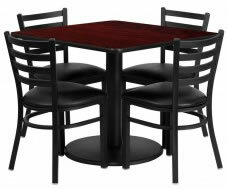 Commercial quality NEW restaurant tables and chairs for your facility. 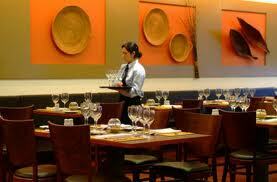 An unparelled selction of elegant, practical & serviceable restaurant furniture awaits you. 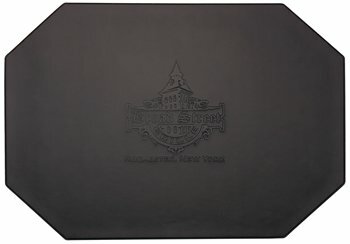 Country Club Table Mats coordinate with your club or restaurant's decor, & add the distinguishing statement of impeccable taste & recognition. Keep the experience of a graceful presentation alive right up until your guest's departure. Order the MenuCoverMan's suave Guest Check Presenters today. Available in soft feel & hardback finishes. 6 different styles of placemats make your choice easy! 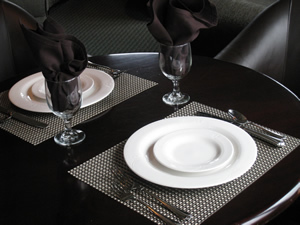 Smooth, textured, Sports Series, Woven Vinyl & Tightweave® Woven Vinyl Restaurant Placemats are worth a peek! 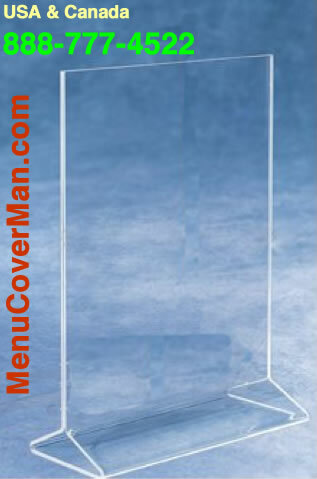 Menu Holders - Acrylic Table Stands are an important component today in assisting you in maximizing profitability. 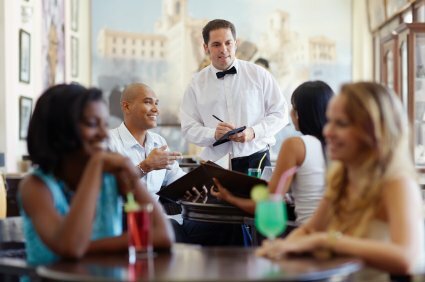 Patrons appreciate the clarity of information that is available to them throughout their dining experience. Compass Three-Sided Table Tents broadcast your message in all directions.., or have something different to say from each unique vantage point. Three-sided table tents feature a hardboard core, album-style corners, magnetic closures & clear sheet protectors to keep your content clean. Call now & speak directly with a friendly & knowledgeable person.. there is never any automated phone nonsense. ALTERNATE PHONE: Call 215-278-4030. Price shown per each when buying 24 pcs. 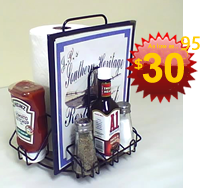 The MACH-1 BBQ Coated Wire Restaurant Menu & Condiments Holder from the MenuCoverMan is designed to please both patrons & management. Keep everything neat & organized on every table, & make refilling easy, too. 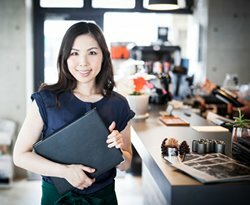 Make an organized, coherent & smart presentation of your hotel's services, phone extensions, health spas, restaurants & what's happening in the vicinity. 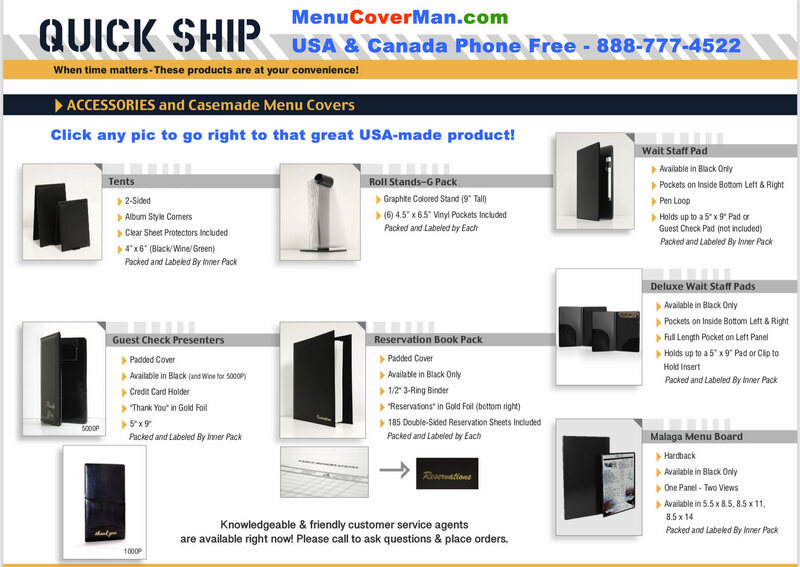 MenuCoverMan delivers throughout the USA & Canada every single day. Live, real & down-to-earth US & Canadian phone representatives serve you with on target information, courtesy & aplomb, wherever you may be. 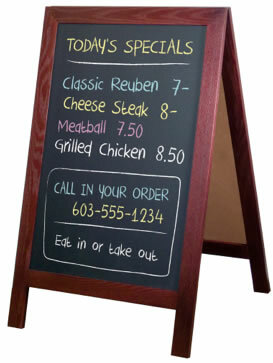 A-Frame restaurant grade outdoor high-quality chalkboard sign. Beautiful solid oak wood frame with hinged top. Available in 5 standard finishes. Dimensions: 24" x 36" chalkboard on each side. 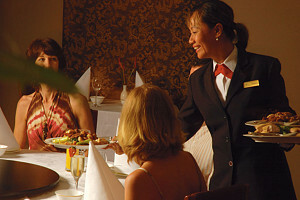 Never has there been a better 'silent salesperson' than MenuCoverMan's Menu-Roll Stand. It's got an exciting appeal that always remains fresh. The desserts, drinks & specials you showcase on the Menuroll Roll Table Top Stand get ordered all day long. Wood & Acrylic bases in-stock. • Call now & speak directly with a friendly & knowledgeable person.. there is never any automated phone nonsense. 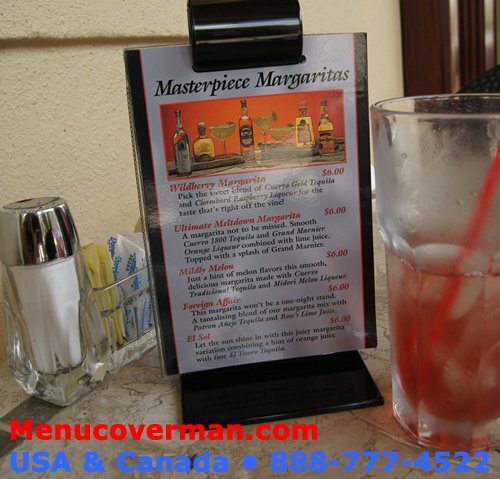 Durable classic restaurant placemats are indicated at a variety of eating & catering venues. Imprint your establishment's name to express your image. Made of soft expanded vinyl. 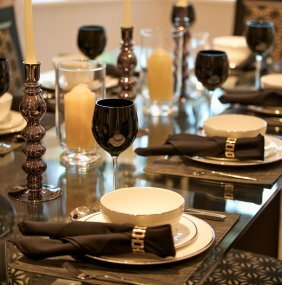 Add elegance to your tabletop with great textures & colors that create an everlasting impression for your guests. Stunning, sleek & beautiful, Cascade Restaurant Table Tents keep your drink, dessert or specials offering on the table throughout the meal- without distracting from the decorous atmosphere of your dining room. IN-STOCK NOW iin 3 sizes- including the SUPERSIZE 8.5 x 11. 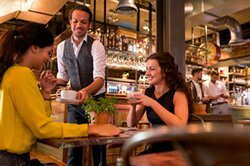 Keep your reservations straight, & accurately fill time slots for maximum client service & profitable throughput. Padded. 1/2" three-ring-binder style. "Reservations" foil stamped in Gold on bottom right corner. • Call now & speak directly with a friendly & knowledgeable person.. there is never any automated phone nonsense. ALTERNATE PHONE: Call 215-278-4030. 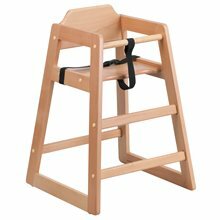 Sturdy & designed with safety & stability in mind, Flash Furniture's High Chairs for babies & toddlers are in use throughout North America. 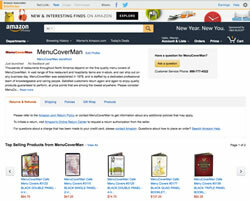 MenuCoverMan keeps them in-stock for immediate shipment to you. Available in Natural (pictured) or Walnut. 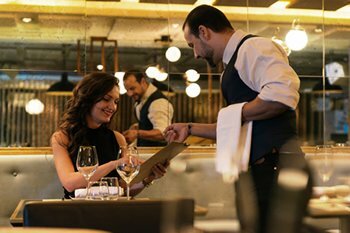 With changing conditions, & ever moving restaurant dynamics, you need the ability to quickly modify your menu with the time of day, the event, the holiday, the chef.. you know the drill. Add-A-Pages give you that flexibility in spades. 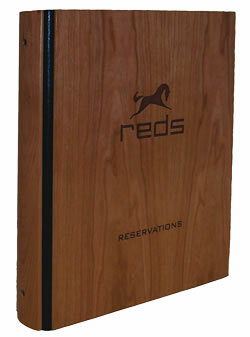 Restaurants use real wood binders for Captain's Books, Wine Lists, & manual reservations control. This is a very high-quality hand-made gorgeous product that conveys stature & professionalism. 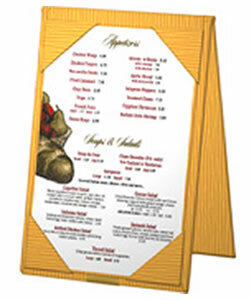 Affix your menu in appropriate menu covers with traditional elastic cords. You really don't have to pay a lot for microfiber cleaning cloths. 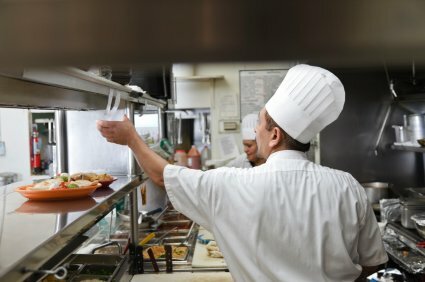 Clean your kitchen, & your entire restaurant the easy way. The most economical alternative, as cloths can be used over & over again. Imagine a guest check presenter where nothing is hidden. Folks don't leave without taking their credit card! You don't have to run after them anymore. Plus- this is a truly economical alternative. Available in both Leatherette & Nylon stitiched-edge models. In-Stock & Can Ship Out Today! You're gonna like what you see! 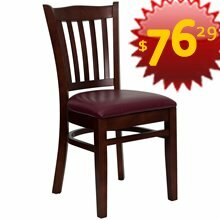 Upgrade & replace old & worn-out chairs in your restaurant. It's less expensive than you think- & the selection is fabulous. Click the pic to see what we're talking about. Free shipping helps a lot too! Store incoming bulk foods on easily- cleaned, non-rusting & quickly moved & reset plastic dunnage racks. Works in any refrigeration environment, including walk-in freezers. Superior air flow system prevents condensation & bacteria build up. One piece seamless plastic construction. Table & Chair Sets - Affordable!! 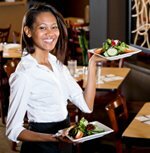 Sized to fit in apron or uniform pocket, these guest checks are great for restaurants of all sizes. Plenty of space for server, table number, order details, more. Chip Board Stiffeners for Menu Covers. If you find your stitched-edge menu covers flopping over, or you see your patrons holding them at the top and the bottom, you may wish to consider inserting low-cost stiffeners to fix the problem. 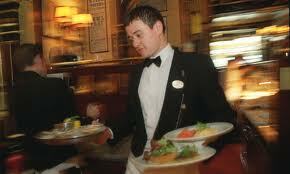 Sharp looking & easily cleaned- waitstaff aprons are in stock for immediate shipment to you. Tuxedo, bistro bi, half-bistro & waist aprons are priced right. Custom fibers don’t shrink & never need ironing. 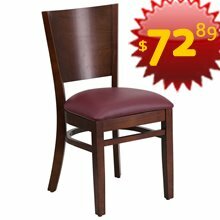 An intelligent choice: color-fast & stain resistant too. Featuring thick, solid crystal-clear acrylic construction, Clearview T-Roll Metal Ring Table Tents / Stands guaranty a bold contemporary look. It invites with a bold presence that gets their attention & has them flipping through the choices, & piping up about what they want.. right now! Country Club Table Mats coordinate with your club or restaurant's decor, & add the distinguishing statement of impeccable taste & recognition. 100% Made In The USA. This is a great choice where "truly low cost" meets "easy to clean!" 100% Made In The USA. 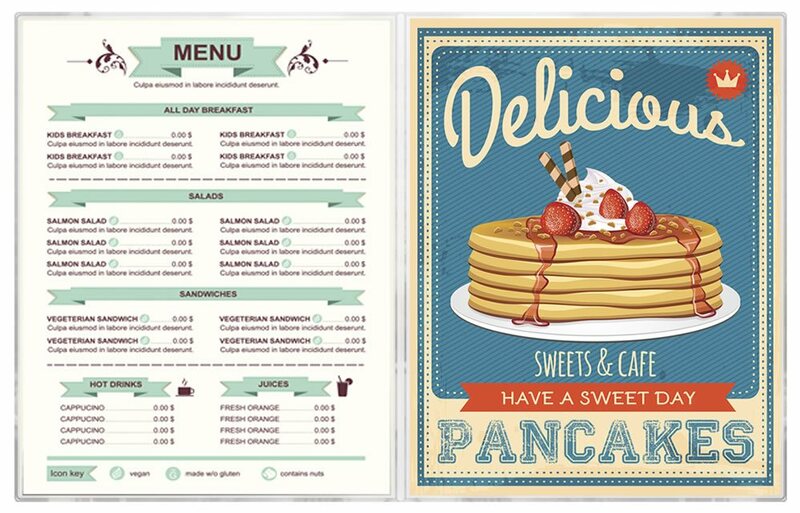 > Explore 50 exciting new menu covers- all on this one page. 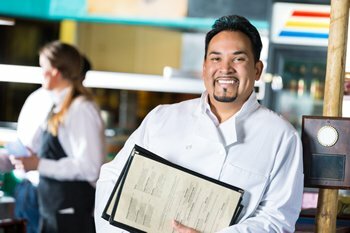 Just SCROLL DOWN to see them- + server aprons, table tents, placemats, restaurant seating, menu rolls, guest check presenters & many other fine products for your restaurant. 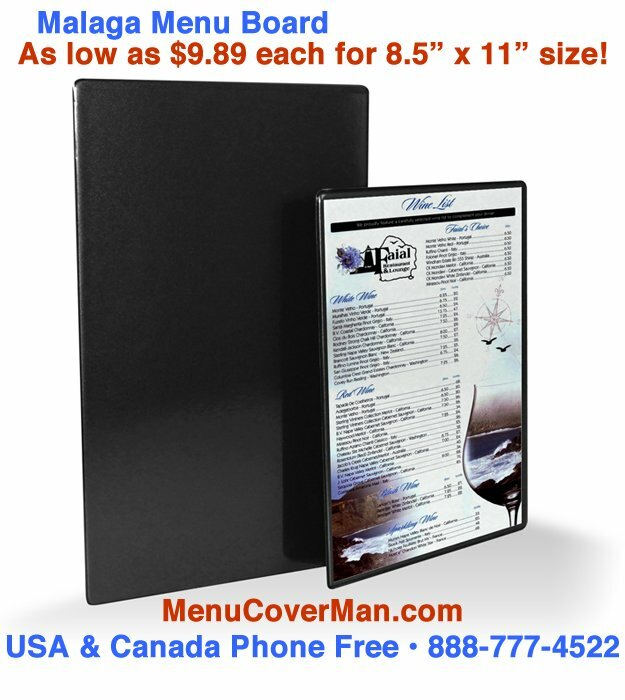 > Over 25,000 American & Canadian restaurants & dining facilities source their beautiful, professional high-quality menu covers from MenuCoverMan. 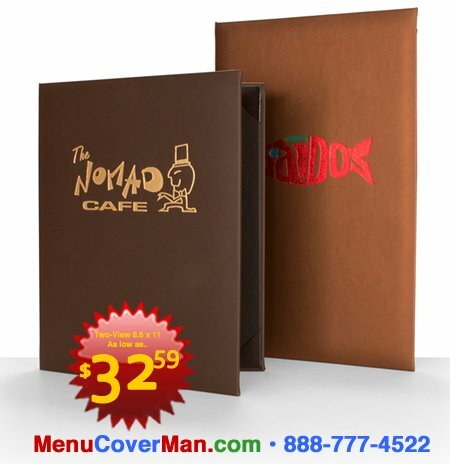 Your lowest priced café menu covers.. 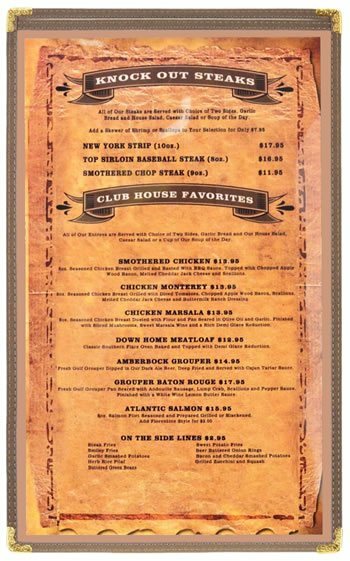 EXPERIENCE the excitement of brand new menu covers showing up fast! Clean, clear, crisp & ready to go to work for you every day! If your budget demands savings, you are in the right place. 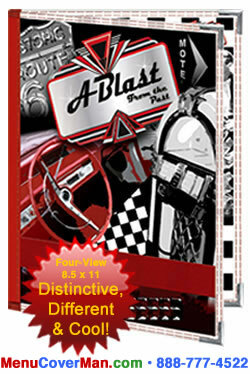 Price shown above is for single-stitched 8.5" x 11" 6-view- 5 case purchase. 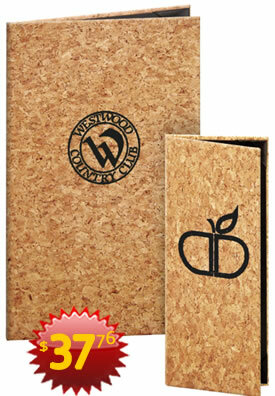 All Simplicity BoxSTOCK BETTER QUALITY menu covers are available in sturdy double-stitched bindings. 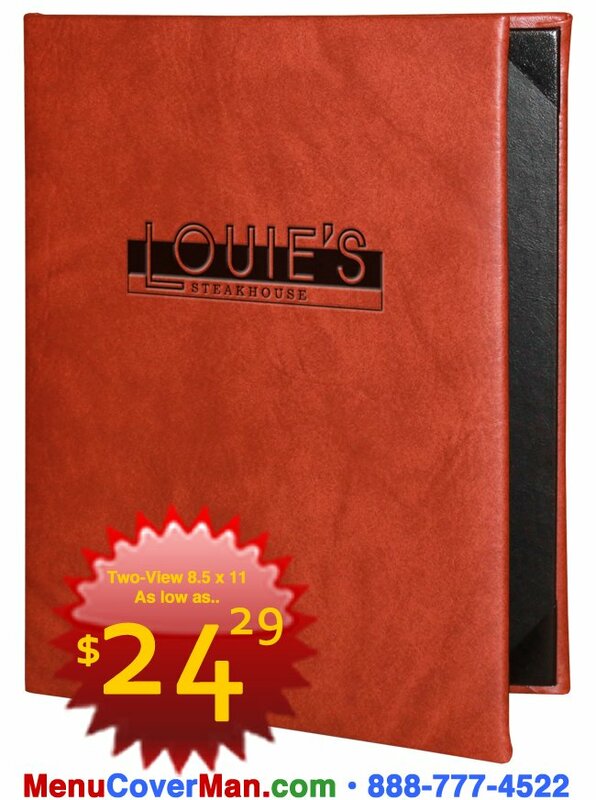 Also find half pocket & combination full + half pocket menu covers not shown in the pricing table just below.. Made with heavy-duty graphic-grade rigid vinyl- it stays flat & your patrons will love it. 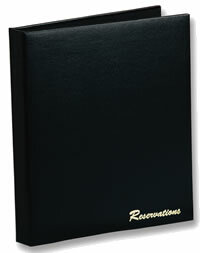 Super budget single-stitched Simplicity BoxSTOCK menu covers are available with black leatherette edges. Longer-lasting double-stitched models in a variety of lively colors also in-stock. Ships today! Pricing shown in all the tables on this page are "As low as.."
F is for Fold-Out Style & B is for Booklet Style. Click the pic above to see samples & to place orders. As low as pricing. 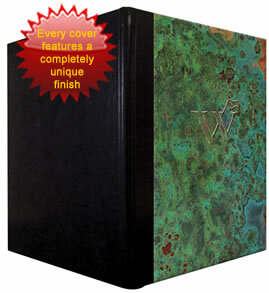 & your longest lasting menu covers. 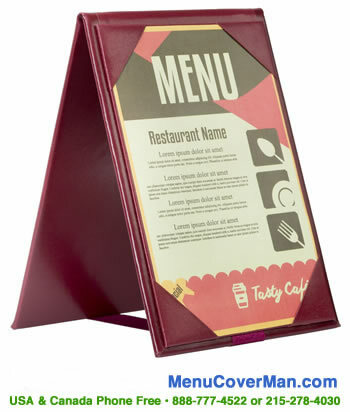 Here's a tried & true cafe menu cover that's proven to last longer in busy restaurant environments than any other. Heavier, stronger, more resilient, highest quality, double-stitched, elegant & just beautiful. Many sizes & colors in-stock for shipment today. 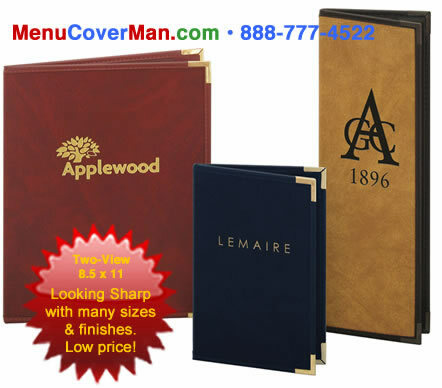 Also find half pocket & combination full + half pocket menu covers not shown in the pricing table just below.. These are your toughest & longest-lasting cafe menu covers. 100% designed & manufactured in the USA. 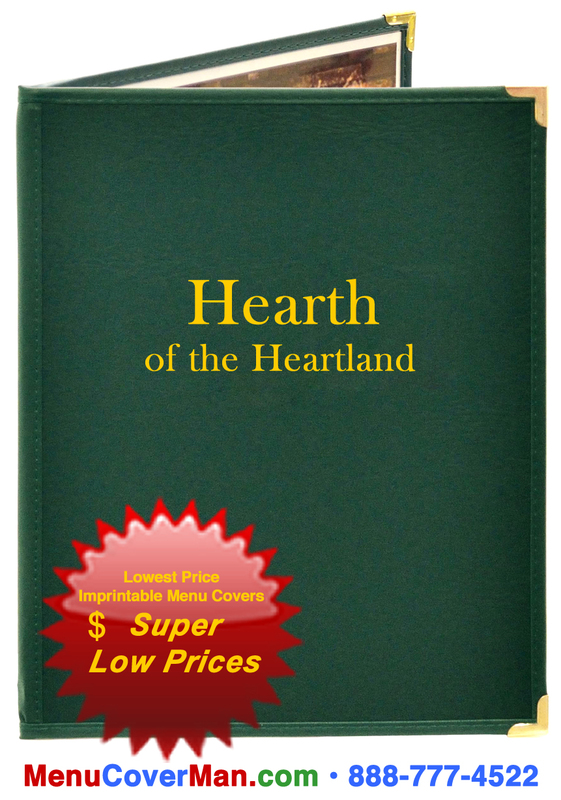 an imprinted cover with status + affordability. 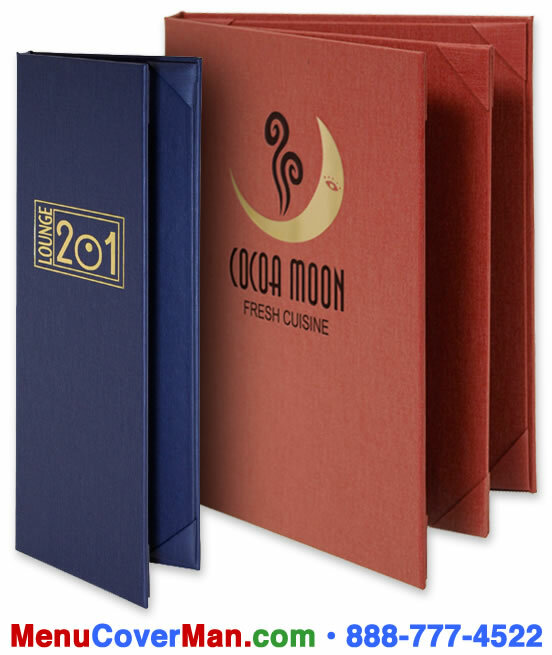 Precision-made, premium & ready to work for you, sewn-edge Pajco menu covers are one of the proven winners for restaurant owners everywhere. Expertly imprinted with your logo. Give us your professionally prepared logo, or we'll make it for you- free. Your imprint die will stay on file- future orders will produce & ship even faster. 100% Made In The USA. Prices shown below are "as low as.."
FREE CUSTOM IMPRINTING for 25 piece orders or more. Make a bold statement with Cascade. An excellent choice you'll be proud to hand your patrons.. at a price that will make you smile. 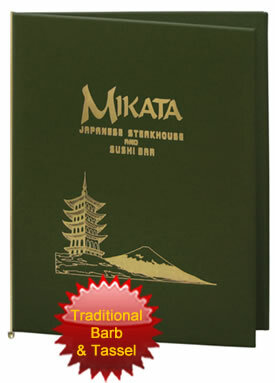 Cascade casebound menu covers are inexpensive. You'll appreciate their combination of superior value along with a price to fit the tightest budgets. Features sleek waterfall edge & classic album-style corners on all panels. Imprintable- give us your logo, or we can make one for you- free. 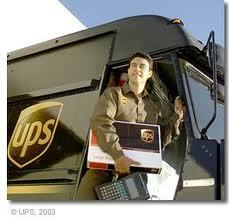 Unimprinted can ship out UPS to you TODAY. Prices shown below are "as low as.."
FREE CUSTOM IMPRINTING for 50 piece orders or more. Get to know Vogue, & you'll be thrilled with your choice. It's simply splendid. 17 nylon fabric edge colors to choose from. You know you're giving your patrons the very best when you put a Vogue menu cover in their hands. 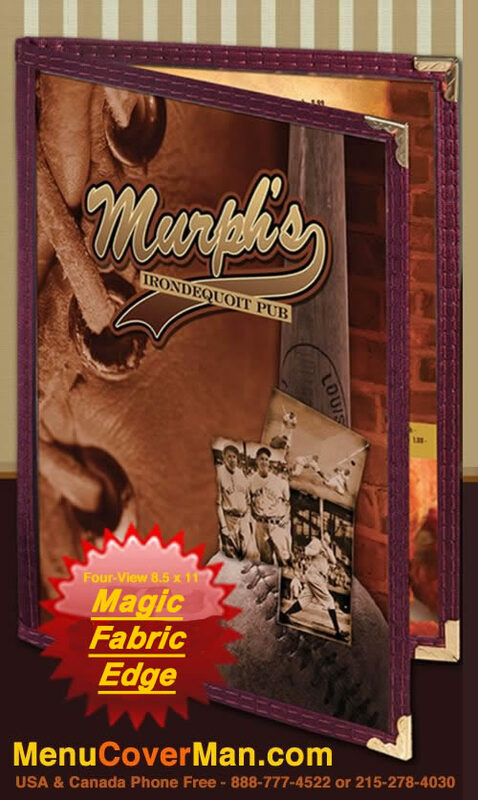 The variety of glistening fabric edge finishes available is tops in the industry. Easily cleaned; will look great for years to come. 17 fabulous nylon fabric colors for YOU to choose from! 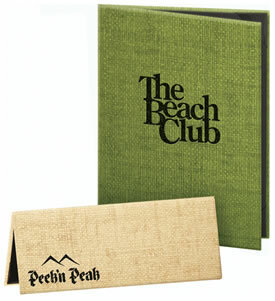 Also find half pocket & combination full + half pocket menu covers not shown in the pricing table just below.. Refined detail & appearance. Some people think all cafe menu covers are alike. Not so.. these are the covers that last & last! Many sizes other than what's shown below. Click the pic to get the full picture. A menu cover that intrigues with a clean, clear & transparent edge & spine. The colorful thread stitching shows right through the clear edges, & the spine is also see-through & crystal-clear. Enjoy many other sizes & configurations than what's shown below. This very cool menu cover has a dedicated, passionate & loyal following, for sure! TRENDING & POPULAR due to its clean & fresh look! Your choice of colorful threads. Black, red, brown, green, light blue, burgundy & yellow are the thread palette you have to work with here. 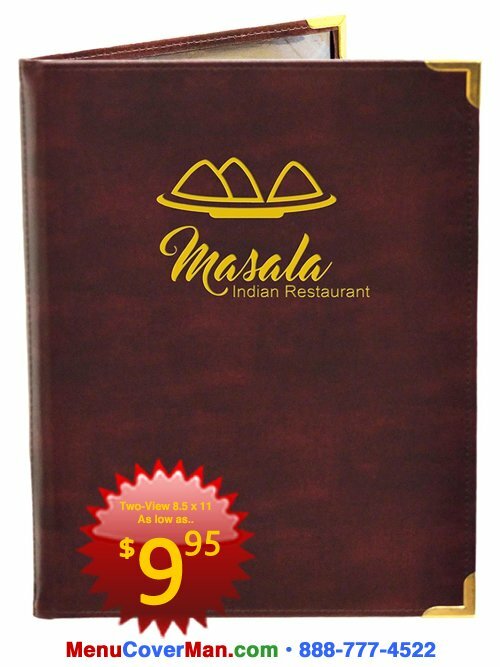 Also find half pocket & combination full + half pocket menu covers not shown in the pricing table just below..
wherever you may call home. 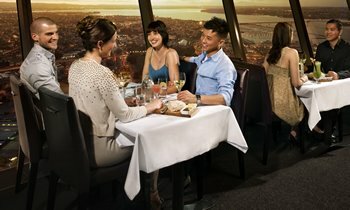 New York Steakhouse is the cosmopolitan statement. It's resilient, sophisticated & ready to engage. Picture your logo right there. Casebound padded covers with a slight grain texture, & coordinating interior album-style corners (Green, Navy & Wine); also, Black interior album-style corners (Black, Brown, Butterscotch, Charcoal, Red & Nugget) Smooth flowing edges..there's no stitching. Padded textured finish adds an unexpected dimension- & the unique varying texture yields a classical sense of something timeless & refined. INSTOCK BLANK CAN SHIP TO YOU TODAY, or imprinted & shipped to you in just 5 days! 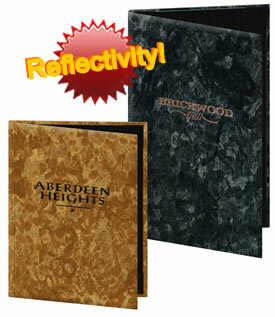 Stocked in a classic Black, Brown & Grey finish, Two-View, 8.5" x 11" or 8.5" x 14". & take Delight to heart. Hardback, imprintable & smart looking. These unique & expressive stitched-edge covers might be just right for you. 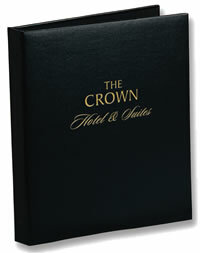 Custom imprinted menu covers are available in a dazzling array of colors & matching or complementary trims. Click the pic to see more exciting samples.. & life-size full-screen enlargements! Dramatic & stunning results are possible with Delight. 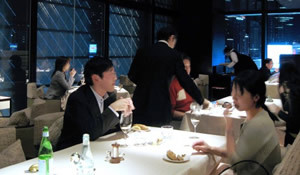 The 10-view cover shown to the right, for example, will accommodate very large menu offerings, & still impress your patrons with a sense of epicurean style. Luminescent & exciting.. your patrons will marvel at the stunning color that shines right through the edge. 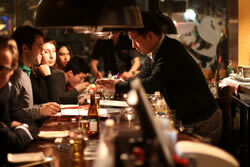 Yours is a bright & bustling restaurant where fun mixes with a festive lively ambience. 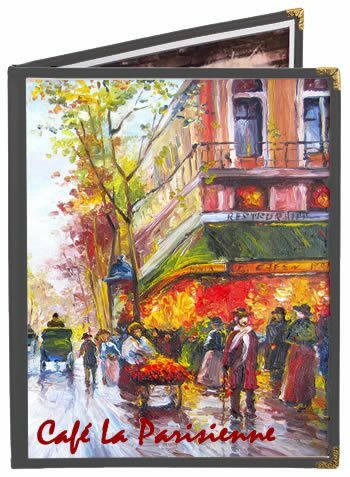 Whether a proud Mexican restaurant, or any happening eatery looking for a lively, trendy & colorful cafe cover, this could be the one for you. Tony smooth SILVER corners add some charm, too! Also find half pocket & combination full + half pocket menu covers not shown in the pricing table just below..
Folks just wanna have fun. They'll fall in love with you the moment you put this nostalgic cover in their hands.. memories of a happy time burst forth- they know they're in for a fun occasion when they start their dining experience. 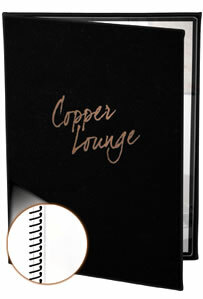 Also find half pocket & combination full + half pocket menu covers not shown in the pricing table just below.. The quality is in, & your name goes on. Stratford Brasserie Menu Covers offer just the right balance of depth & light, & show off your name against a lustrous deep-field background. Durable & long-lasting! Refined imprinting process. *Select sizes in stock, & can ship today, or imprinted in just 5 business days. Click to see smart gold & silver foil imprinted samples. Highly recommended for great first impressions. & do what makes sense! your valuable time from always having to reprint it every week due to dirt, grease, tearing & folding. 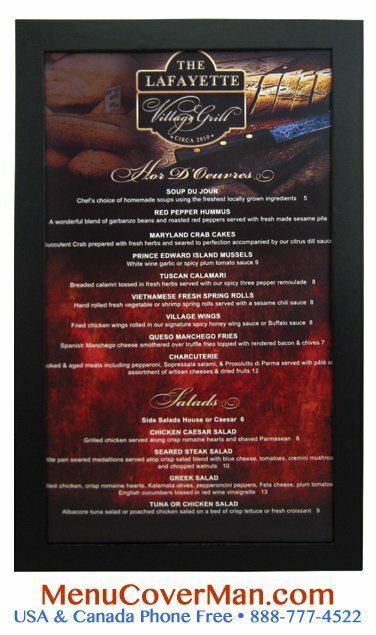 Malaga Menu Board allows you to display TWO menus- one on either side of the central board. OR, you may choose to only display a single menu. It's fast, simple & easy. No imprint is possible. 100% Made In The USA. OK- Here's the fine print.. MOST ORDERS FREE SHIP $139+ IN THE LOWER 48. For your orders which are below $139+, $14.50 S/H... UPS nicely subsidized to Canada, Alaska, Hawaii, Puerto Rico, USVI, Guam, Palau, American Samoa & the Northern Mariana Islands. SALES TAX FREE EXCEPT PA, FL & CANADA. HEAVY DUTY & INDESTRUCTABLE !!! 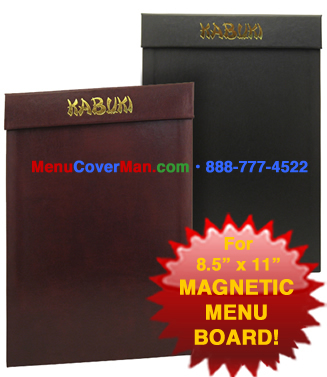 The MACH-1 BBQ Coated Wire Restaurant Menu & Condiments Holder from the MenuCoverrMan is designed to please both patrons & management. TWO OTHER STYLES.. CLICK PIC TO VIEW! Affordable. Easy to use. Clearly superior. USA Quality!! The edges are heat-sealed vinyl, sold by the dozen, & in stock for you now. Many sizes, (more than what's shown below!) & new, clean & fresh configurations! Please click to see all the sizes. FAST FREE SHIPPING on orders of $139 or more. Clear vinyl covers are more popular than ever. 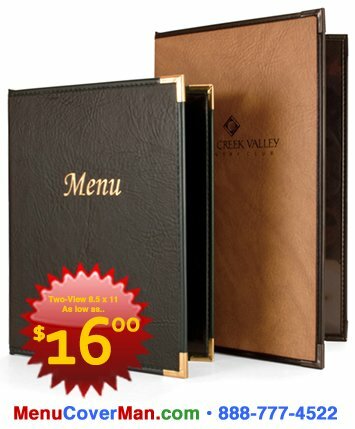 Cheap menu cover price.. top notch quality! Click the pic above to see samples & to place orders. As low as pricing. 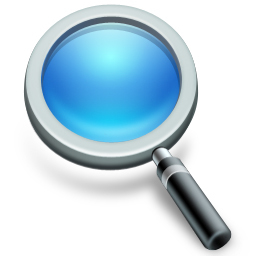 See more sizes than what's shown. Click any pic to view! picture it with your name & logo?? A smart & practical padded cover.. plus easy-to-change cafe-style pockets. 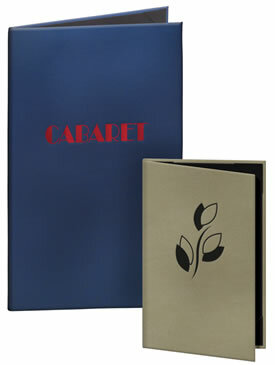 Yes, you can have the look you want- & your name & logo will shine in gold foil on the Allante menu cover. Whether you're opening a new restaurant, or looking for new fresh covers, here is one to consider. 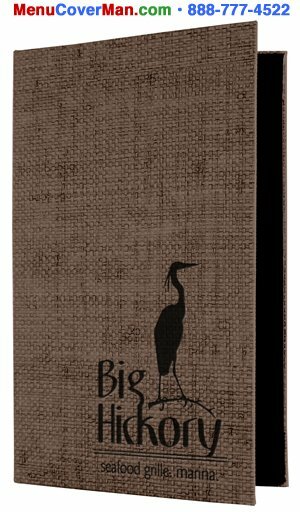 An inexpensive menu cover with a top-shelf appeal. A grand presentation with an unbeatable price tag. You can make it happen. 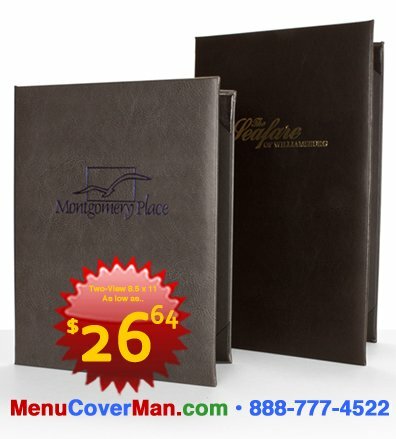 The lowest-cost imprinted menu cover you can buy. Your logo looks great, & your accountant will be pleased as well. 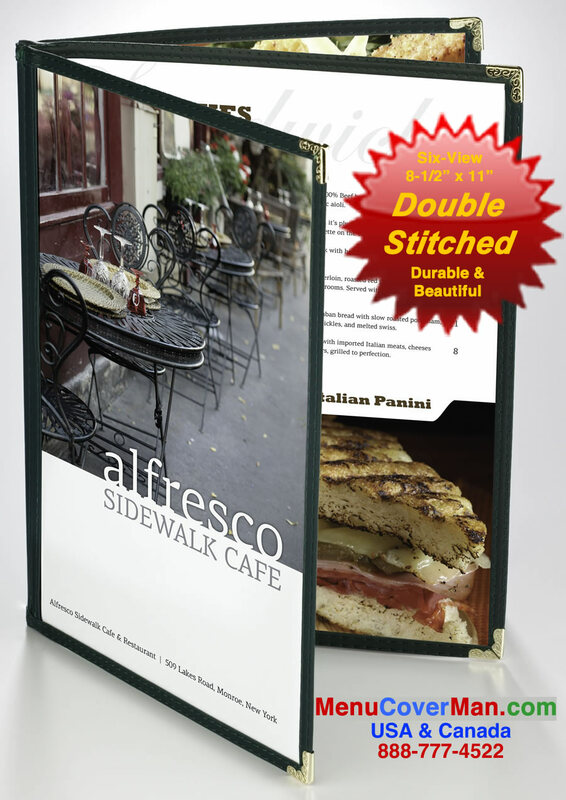 Pacifico Pajco menu covers are an affordable quality semi-flexible cover with inside cafe-style pockets. They are made from a premium soft leather-like thick supported vinyl. 99% in-stock! Genuine leather is for real. Genuine Cordoba Leather. It's your classic & quintessential leather padded cover.. only top quality leather is employed to produce this impeccable cover. 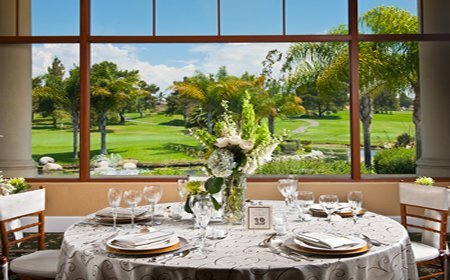 country club dining, golf & raquet venues. 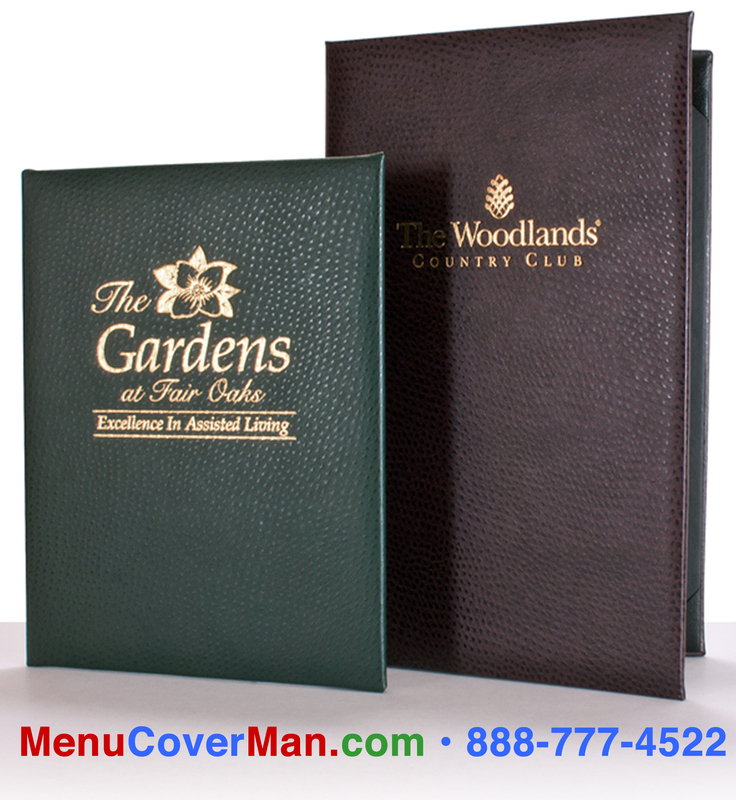 Not all leather menu covers are of the highest grade, the most soft & supple, with the best resplendent sheen. 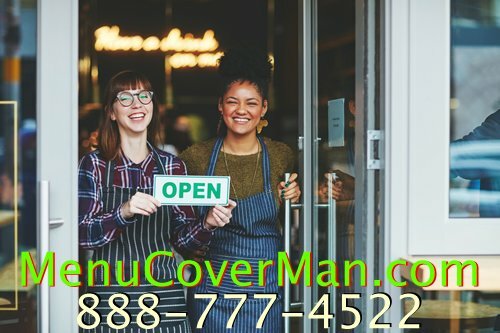 MenuCoverMan's are- & they are the very best quality you can buy. You say you want what? Alright, alright. Here they are.. 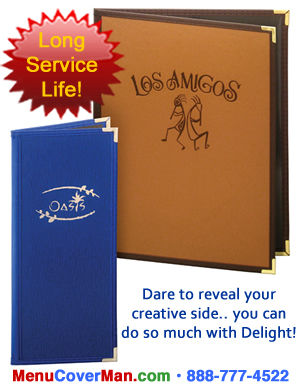 Dependable Seville menu covers deliver value while projecting a chic, positive & upbeat look. The popular price point allows for economy without sacrificing genuine quality & longevity. Coordinating trim, stitched edge, gold corners, slight grain texture, interior insertable pockets, imprintable. Some of these are Quickship, too. Perennially popular, built to last, & the most available finishes of any cover. 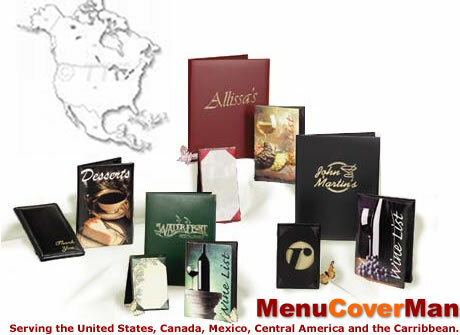 For better restaurants everywhere, Bistro menu covers offer you the presentation you are looking for - contemporary, Tapas, Asian, Fusion, Continental & Cosmopolitan motifs. 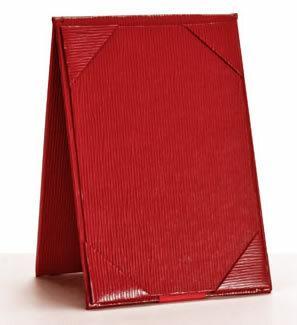 Solid, rigid, casebound covers with album-style corners. More fabric & high-grade vinyl choices than you can shake a stick at. PLEASE do visit the page by clicking the pic- so you can see the many moods, styles & finishes of the fabulous Bistro line. Imprintable- & irresistable. menu cover. It's truly a standout. A crisp, clean presentation sets the stage for gracious dining. Exceptional detail & perfection in imprinting makes all the difference. Same material stitched edging (look closely), coordinating interior, subtle grain pattern, deluxe gold corners, & the finest imprint quality. 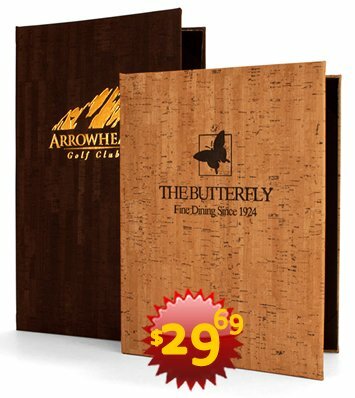 You'll be proud to offer these exceptional menu covers to your patrons. Available quantity discounts. to be a magical moment. 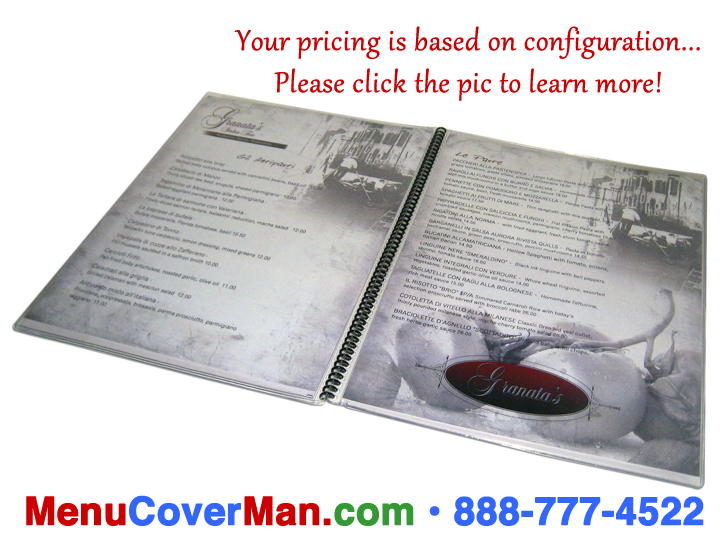 You can count on your new Seville Deluxe Menu Covers to do that in stunning fashion. That's what your patron experiences when your server hands them their gorgeously foil-imprinted menu covers.. & a magical evening begins. Seville Deluxe features elegant album-style corners on every interior page- classic & classy! 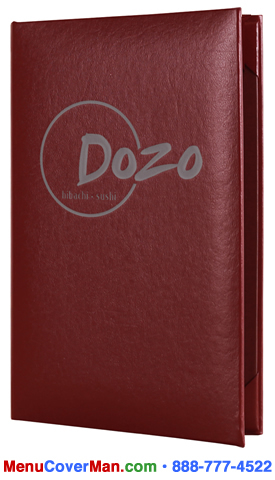 Slimline Menu Covers are the way to go. 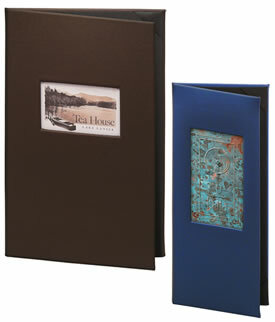 Two-view & thin, classy black album style interior corners hold your beautiful menus. 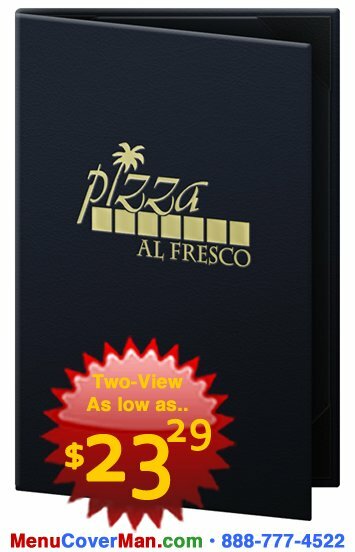 Enjoy a slimmer profile than other casebound menu covers. Here's why: It's easy for your servers to carry to station, easy to retrieve, & easy to store where space is tight- without sacrificing appearance. Leather-like feel.. & thinner than all the rest! romantic story whispered on the wind. Cork evokes a quiet mediterranean mood, invoking thoughts of wine. It's real & you can watch your patrons smile in satisfaction when your server delivers these. Experience it - it's an amazing look & feel! Casebound, padded, authentic cork material, black interior & album style corners. 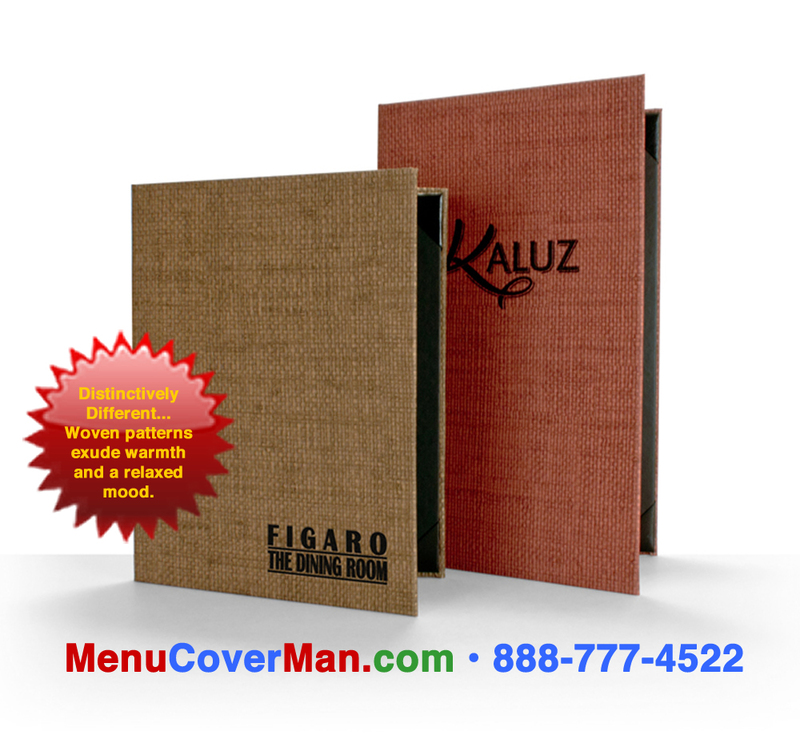 Give your patrons the sophisticated & glamourous experience of this exemplary padded menu cover. Brilliant, glossy & reflective, the nuanced Iridescent menu cover features a smooth texture on its face, with a sleek interior. 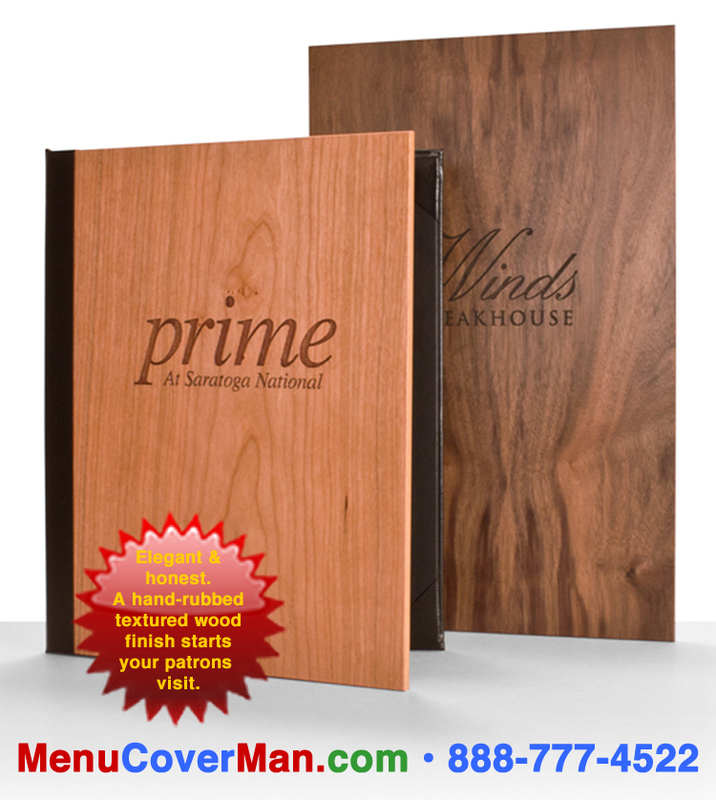 Vibrant custom imprinted menu covers are part of the cachet of your restaurant. 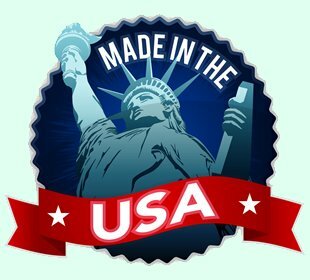 USA MADE symbol indicates products which are made by skilled & dedicated American workers. The majority of the products here are proudly USA made. Keep jobs in the USA, build new factories in the USA, & put people to work in good paying jobs right here in the USA. 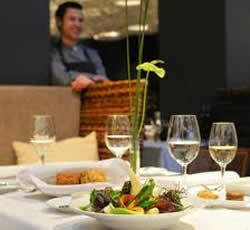 straightforward yet still rich & sumptuous presentation is called for. This is the most popular high-end menu cover on the market today. here's the way to show it all. 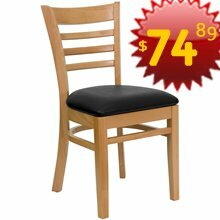 Classic, classy & capacity to spare.. indicated for the finest restaurants & wineries. You can easily add or remove pages, showcasing different menus, special events, catered banquets, desserts or special wines & liqueurs. Padded covers with clear spiraled pages. One spiral page included in price. Additional spiral pages available for up to 12 pages & 24 viewing sides. Nice grain, imprintable & soft to-the-touch. 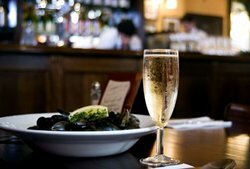 A smart choice when your goal is to appeal to a savvy gourmand & still maintain a groove that speaks to the young urban patron. Click the pic to see more exciting samples.. & life-size full-screen enlargements! FREE CUSTOM IMPRINTING for 25 piece orders or more..
& winelists in stride. 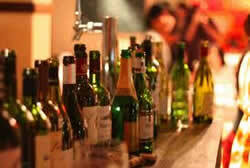 So easy to use..
Have a large menu or winelist? 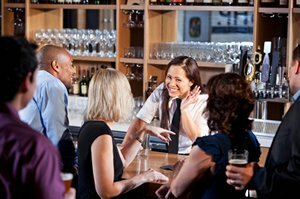 Imagine displaying all your wonderful wines & spirits, or swapping out dinner or catering specials pages as needs change, easily. Pinehurst promises a limitless listing of your offering. Pinehurst utilizes a tried & true screwpost technology to get it done. 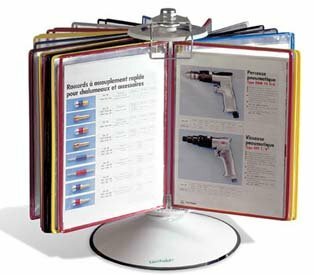 Also available equipped with a convenient high-capacity ring binder system. Woven Rattan is now here for you..
Rattan will weave its way into your patron's heart. Reflect your personal zeitgeist & ooze atmosphere. People will know. Go ahead.. create that mood with this spectacular concept cover. The organic woven texture brings you back to Mother Earth, to what's true & to a tranquil sense of well-being. Indicated in Pan-Asian restaurants, tropically themed eateries, & anywhere a rattan woven look will spotlight your themes. 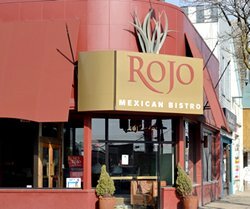 Enhance an authentric dining experience. FREE CUSTOM IMPRINTING for 25 piece orders or more. 100% Made In The USA. Just what you need, & most can ship out today. All above EXCEPT LED 100% Made In The USA. Fun, fast & did we mention.. easy? 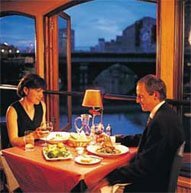 For one page menus & wine lists. NEW Magnetic menu boards are a SNAP to change. Change your menu oh so quickly! 3. Assemble with screw posts supplied on the cover & VOILA! A perfect & amazingly unique menu every time to showcase your artistry. Slim lightweight design. Detachable hinge. Easily accommodates up to 12 Pages. Create fetching one-of-a-kind designs. Arts and Crafts design values. Wood electrifies with a viseral appeal, a natural authenticity that is honest, accessible & heartfelt. Just holding it in your hands is enough to elevate the a sense of comfort. It's not old-fashioned, but it implies our best values in a most forthright way. Choose Walnut Wood, Maple Wood or Cherry Wood front panel; then choose Black, Brown or Wine Tuxedo bonded leather for 3/4 bind hard back panel, as shown in the picture. Black lining and album-style corners. Laser engraved customization is available. A wood back panel is also available. FREE CUSTOM LASER IMPRINTING for 50 piece orders or more. The warm look of cork.. with easy maintenance & high resilience. Create a magical atmosphere at first blush. Faux cork exudes depth & romance. Bring your patrons a warm welcome, an ingratiating smile, a glass of fragrant chianti.. & menu covers which convey the message: relax & enjoy! Great for Italian restaurants, Greek restaurants & any restaurant that values a stunning first impression. that reflect light & dreams? 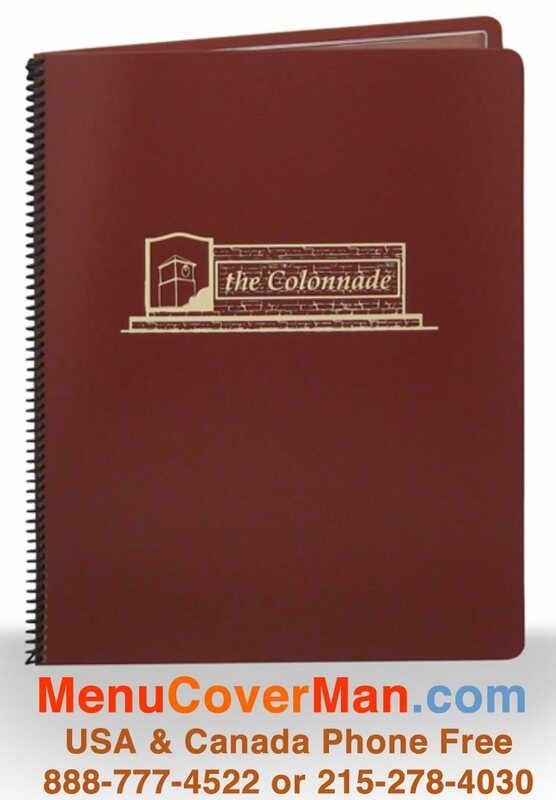 Brushed metallic menu covers conclusively make the ultimate statement about your restaurant's caliber & refinement. Scintillating, smart, reflective, accomplished, & add a measure of gravitas.. that's the Brushed Metallic presentation. 6 gorgeous finishes to choose from: Brushed Bronze, Chrome, Copper, Gold, Silver & Steel. Please do take a look at close-ups of the brushed material. 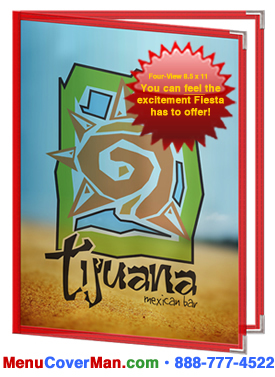 Click on the pic & witness the state-of-the-art in the craft of USA menu cover manufacturing. Every Patina cover is a reflection of you.. completely unique. No two are alike. Every patina finish is different- no two are alike, due to unique engraving process on the face of the cover. Patina menu covers are brand new but they allude to something old.. history, tradition, richness & a marked sense of authenticity. 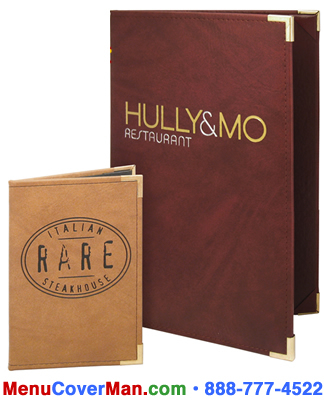 Your patrons will feel a part of that richness the moment they take hold of these sumptuous & impressive copper menu covers. Truly- this is one of the finest menu presentation products on the market today. on a logo, theme or design..
& that makes all the difference! 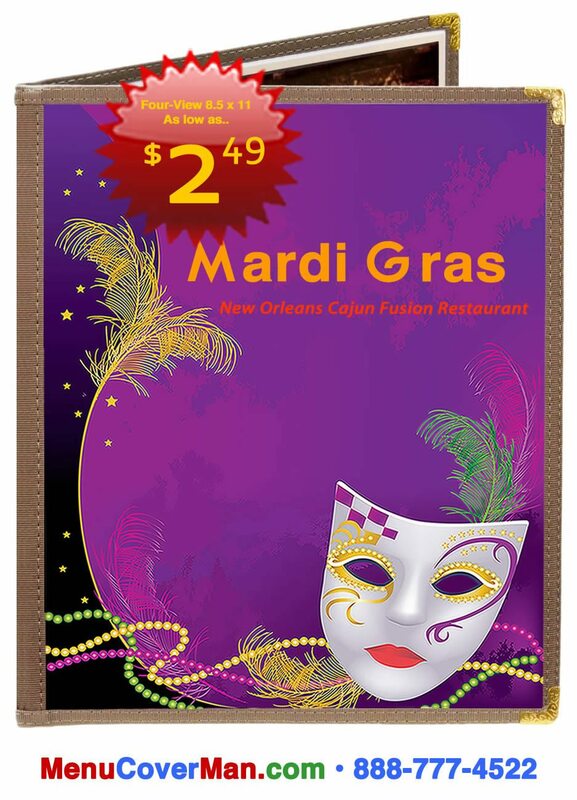 Stand out from the crowd.. design your own custom die-cut menu covers today! A die-cut window opening dramatically displays your chosen photo, imprint image or design. You can even include a genuine copper patina, as shown in the blue cover above. Laser engraving on wood offers a compelling look as well. 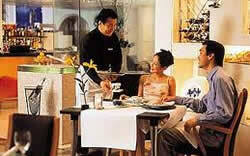 Distinguished restaurants make the cut..
Utilizes elastic cords, barb, ball or tassel to hold menu in place. Look carefully at the lower left hand corner in the image above and you'll see the external & traditional decorative spherical steel ball. Augusta Menu Covers are the way things used to be: they hold a single page in place with an elastic cord. You can use two or four of those 'views' on the folded page. This cover is casebound & padded. Good size creative menus are more than possible with this platform. 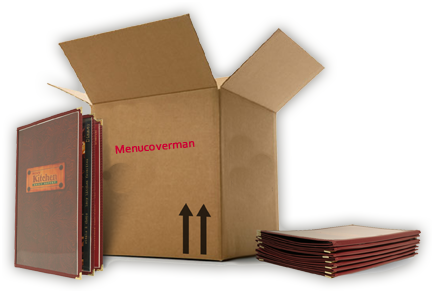 The simplicity of Menucoverman's clear spiral menu covers belies their incredibly high acceptance factor: they're hip, trendy & definitely 'in' from Hollywood to New York's Restaurant Row. 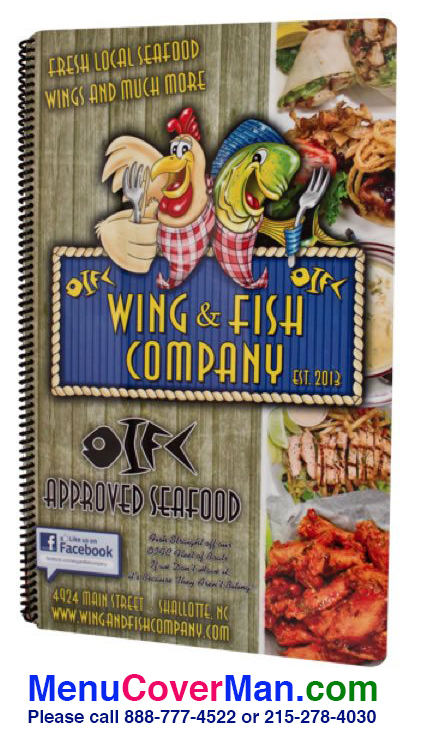 You'll be able to create just the menu cover you want... size, number of pages, & of course content: take graphics quality paper, print your menu including colorful imagery, insert- & just like that you have a stunning presentation that will inspire the results you seek. 100% Made In The USA. your offering in a whole new light! Picture this.. a dramatic one or two page presentation that commands interest & attention. You don't open this menu cover, it is open on arrival- open & available when it is put in your patron's hands. You can feel the excitement! 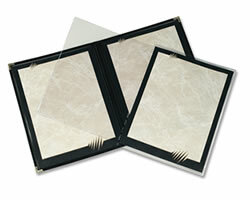 Your intense & creative insert is PROTECTED by the rigid framing, & by the clear vinyl sheet protector (included.) 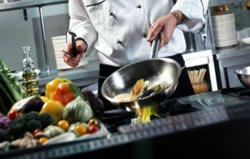 Great for caterers, special events & restaurants everywhere! The 1-View is one side, & the 2-View is front & back. Fancy is as fancy does. 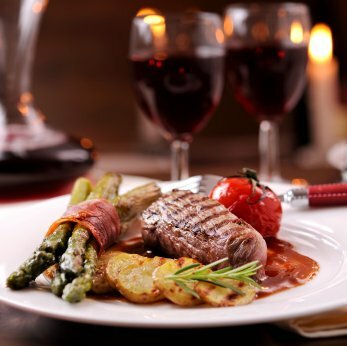 Fresh, attractive, shiny & glistening.. offer a wine or a dessert, even in the classiest venue. Here's a truly beautiful way to offer compelling suggestions. The problem has been: How do you put a table tent out in a fancy dining room? The answer is to put out a fancy table tent. That would be your Bistro tents, & the picture here doesn't do its in-person good looks justice. Trust us. Plus UPS. 100% Made In The USA. Sleek & attractive, the Menu Roll is there throughout the meal. Shown with a plastic base.. & a solid wood base is also available. Watch your ticket size grow overnight. Do an experiment. 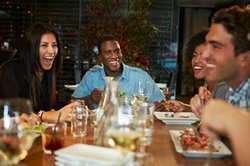 Put the Menu Roll out for a week, & see if your average ticket per table increases. You'll be amazed at the power of this addition- to showcase specials, drinks, desserts, & upcoming events. The Menu Roll will pay for itself in that first week on the job.. there's another good reason to go for it. Plus UPS. Long service life, & way under budget. A better look & feel at a very low price. 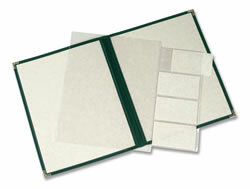 Nylon fabric binding edge covers are good quality, & will last for years. Heavy duty graphic grade 10 gauge rigid vinyl stays flat. Steel Grey or Brown fabric edges available. An economical alternative for tight budgets. 99% in-stock & ships out today. 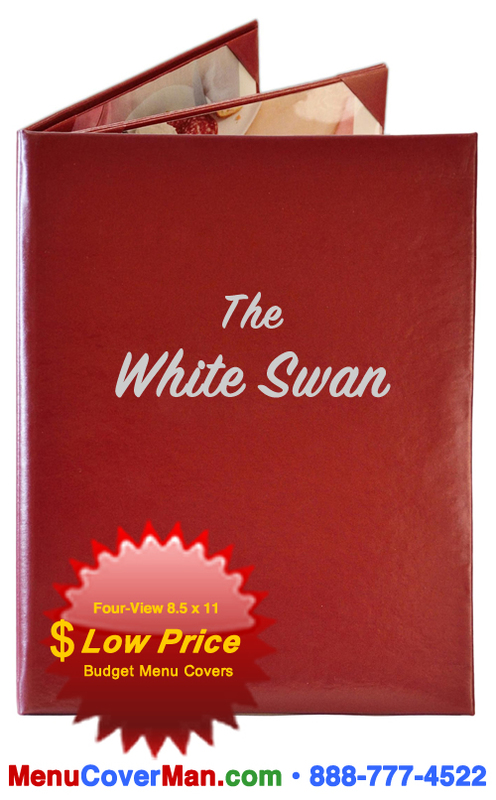 You read right: A 6-view cover for $2.99! 2-view: $1.59!! Design & layout included in the price! Long Life, Easily Cleaned, Colorful, & well, just fantastic! Tell us what you want to say, & we'll put it all together for you. Working in sync, you'll receive a spectacular one-of-a-kind menu- including all design work, printing, & binding. It'll be the size you want, & the number of views you need. The covers last & last as water can't hurt it, & the spiral binding is tough. Plus- we'll keep your covers on file digitally, so when it's time to upgrade pricing or design, it's done simple as pie. Call today to discuss your requirements. 100% Made In The USA. Classic & Classy.. indicated for the finest restaurants. You can easily add or remove pages, showcasing different menus, special events, catered banquets, desserts or special wines & liqueurs. 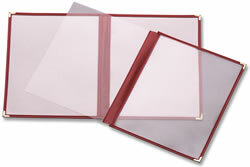 Pajco covers with clear spiraled pages. One spiral page included in price. 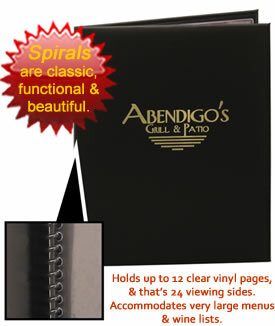 Additional spiral pages available for up to 12 pages & 24 viewing sides sold separately. Prices below are "as low as.."
Distinguish your presentation. Add affordable elegance. Create a memorable impression. Make a big change today. many beautiful designs & colors. Instock & ships today! Instock for free delivery to you! 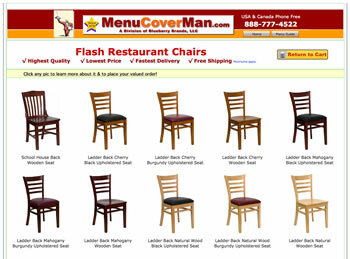 Come see the exciting Flash Furniture line of high-quality commercial restaurant chairs. & MenuCoverMan makes it fast & easy. 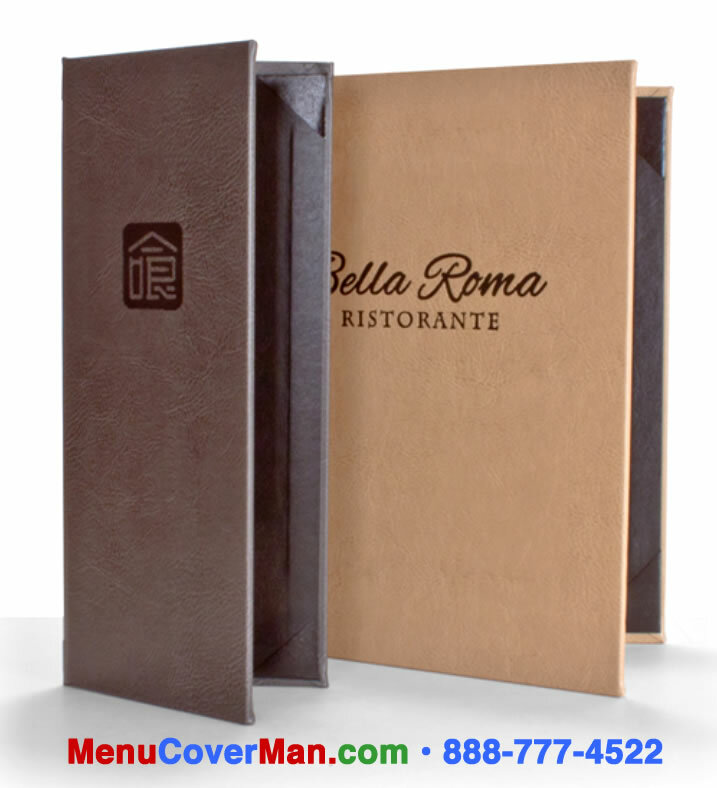 Whether you need the least expensive menu covers in large quantity, or high-end casebound covers embossed with your restaurant's name, call Menucoverman today. Stock items will ship right out. Custom made products are produced quickly. Need expedited service? You can count on it. Talk to us about your needs today. 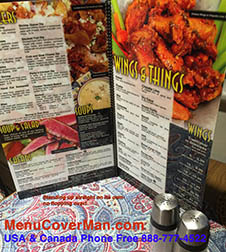 Take a look at the Menucoverman 36 page catalog. 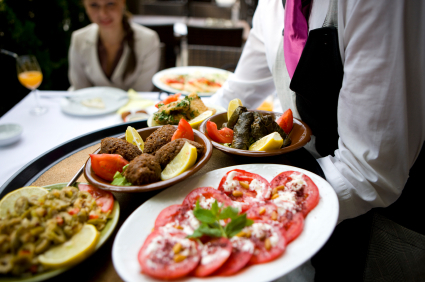 Get great ideas to enhance your restaurant's efficiency, profitability, image & appeal. View online, or offline. All kinds of businesses are using social media to promote their content & their brand online, & restaurants are no stranger to this approach. 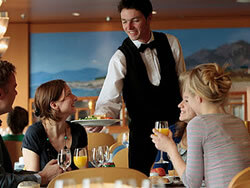 But what is the most effective way to go about restaurant promotion through social media networks? Your art will never look better. 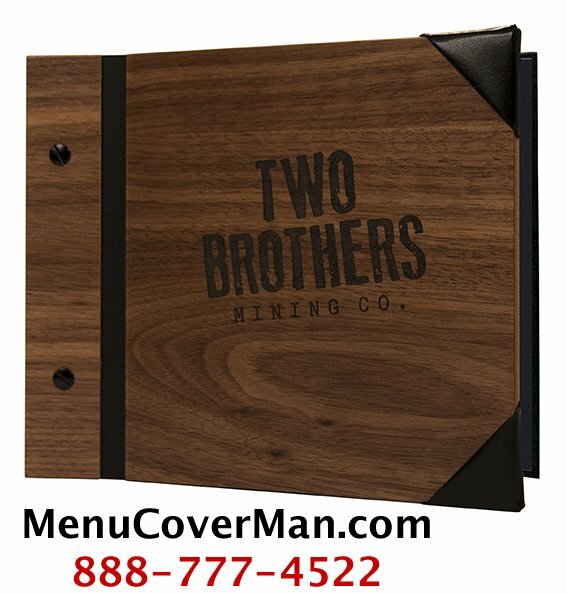 Imprinted, debossed with gold or silver or other color foil, your menu covers will look sharp, professional & put your patrons in the mood.. for a great dining experience. Call to place orders, ask questions & discuss your needs.. immediately- there's no frustrating, automated list of options. Just call & talk.. right now. Experienced, knowledgeable & friendly customer service representatives are standing by, 9AM to 11PM, EST, 7 days a week. Most of the products on this website are made right here, & ship factory direct to you. Factory pricing & sourcing always benefits you with the lowest possible cost, & the fastest shipping times. It's all about the presentation. 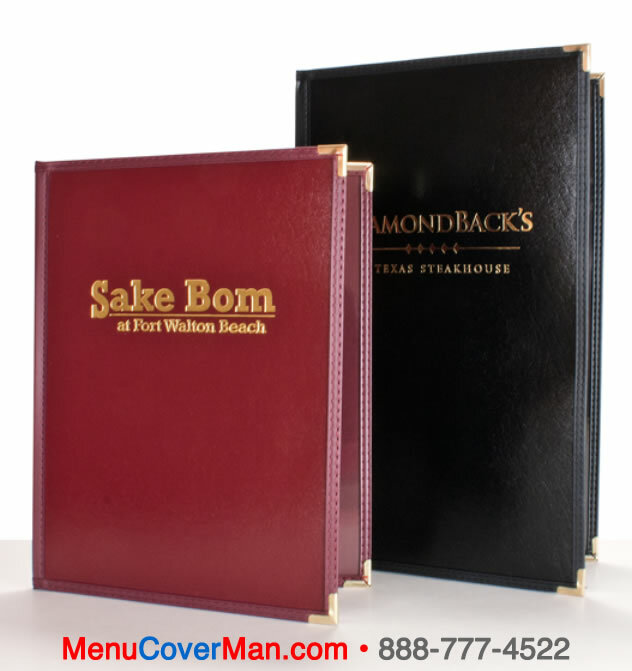 Menu Covers preserve & protect your menus, & impart the tone of your restaurant. 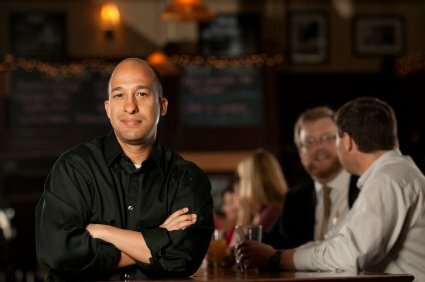 Engage the expectations of your patrons. 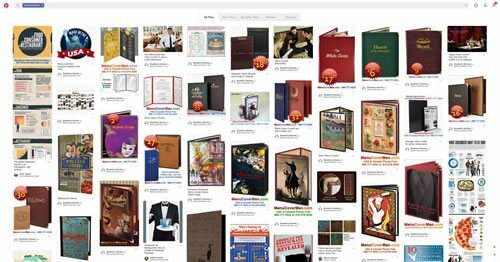 Don't see what you want on this page? 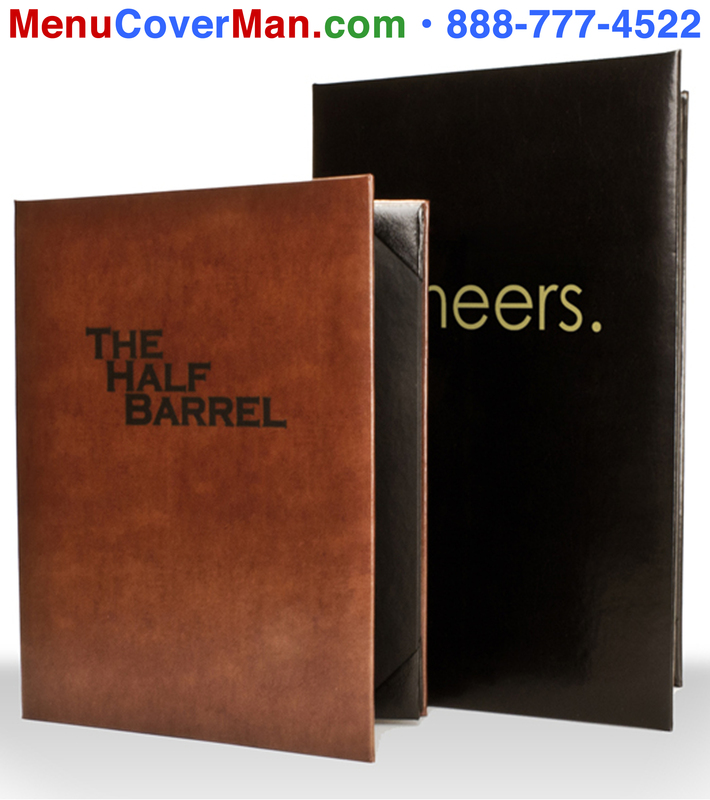 Here's a great selection of other menu covers, styles & ideas for you to consider. Blueberry Brands, LLC presents The Disposer™, a proven & attractive solution that extinguishes & eliminates unsightly butts, empties in seconds...where the problem begins. 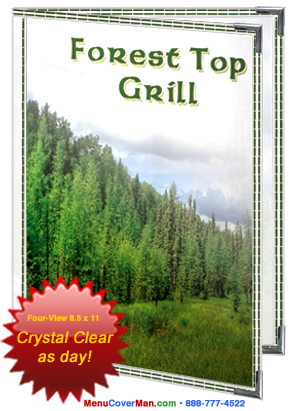 Great for outdoor food service areas. Blueberry Brands EcoBin™ recyle bins are the best recycling bins available on the market today due to their ergonomic design, sanitary features, innovative fabrication, strong weight capabilities & durability. Indicated for public spaces & comercial kitchens, caterers & banquet halls. 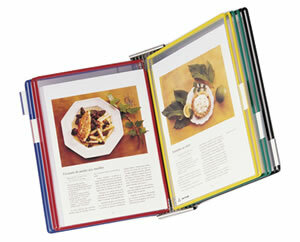 Tarifold organizers are employed in thousands of commercial kitchens across North America. 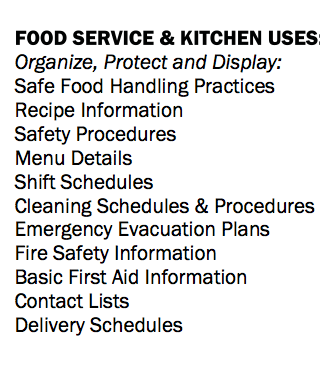 There are no electronics to spark & fizzle- just clear & visible access to recipes, work schedules, catering plans, supplier information & staff contact information. Availabe in a stunning array of useful configurations. ..PRECISELY when & where they're needed. The ColdStor™ Food, Ice & Beverage Bin is a lifesaver for caterers, stadiums, off-location events, parties, etc. This amazing unit has capacity to spare, is available in a moment's notice, & can handle the big jobs. Take a look! are in-stock & can ship out to you today- for tomorrow's delivery. 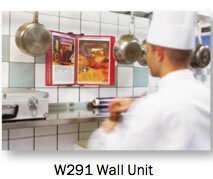 The Tarifold W291 Wall Unit is a handy non-electronic method for quick recipe access in commercial kitchens. 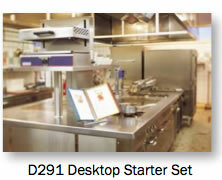 The Tarifold D291 Wall Unit is a handy non-electronic method for quick recipe access in commercial kitchens.